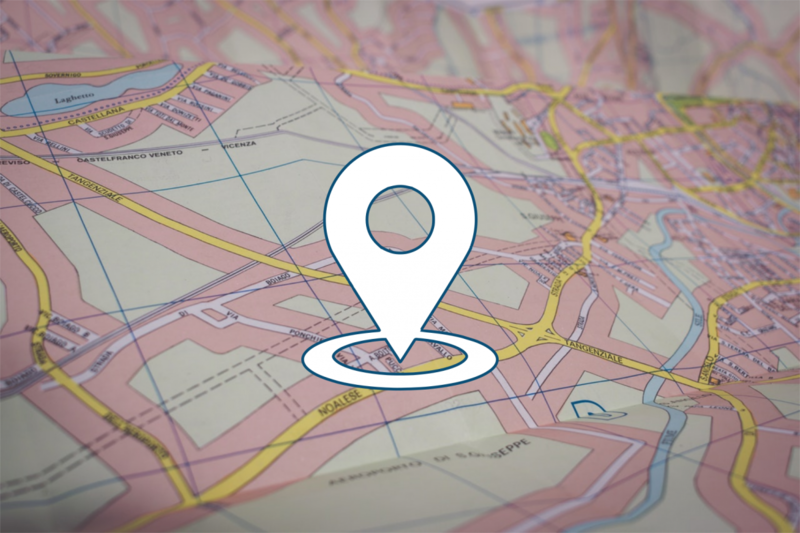 It’s not something you often think about, but location services are probably one of the most-used features on your smartphone. A multitude of apps—from Pokémon GO to Snapchat—rely on your location to personalize your experience and provide you with more features. Of course, this goes beyond just casual app usage. Accurate location is everything when you’re driving around a big city looking for a parking space. Unfortunately, when it comes to the vast majority of modern devices, accurate location is not something you can be 100% sure of. Your phone determines its position by listening to radio signals from satellites in outer space, or Global Satellite Navigation Systems (GNSS). The norm in today’s smartphone market is single-frequency GNSS. In essence, what this means is that your smartphone tracks a single radio signal from each satellite. 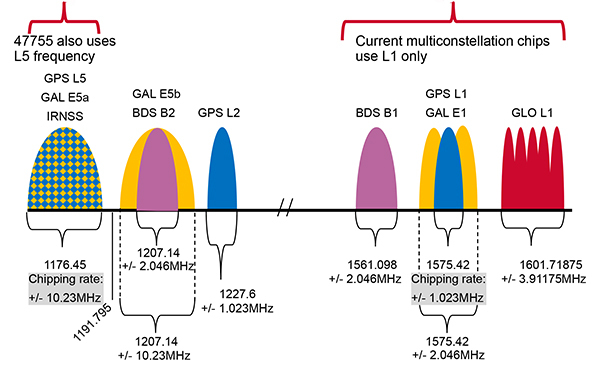 However, single-frequency GNSS is prone to multipath errors. Multipath errors occur when a signal bounces off of large objects such as buildings, resulting in multiple “echo” signals reaching the device. This can result in inaccuracies of around 5 meters. In real-world terms, what this means is that in big cities, your mapping app may not be able to tell exactly which street you’re on. While better quality antennae can be more accurate, it’s common for your phone to report incorrect locations in built-up areas due to multipath errors. So how does dual-frequency GNSS rectify this issue? The short answer is two is better than one. Instead of relying on just one signal to determine your location, devices track more than one signal from each satellite, each on a different radio frequency. For Americans with the GPS systems, the frequencies are called L1 and L5. For Europeans with the Galileo satellites, the frequencies are called E1 and E5a. While most current devices only use the L1/E1 frequency, dual-frequency-enabled devices make use of both. The L5/E5a signals are more advanced, and thus less prone to multipath errors. They can be used to refine position accuracy to as low as 30cm (versus the 5m mentioned earlier). Dual-frequency GNSS is not exactly new technology. Support for it was added in Android 8.0 Oreo back in August 2017. Broadcom followed this by launching a dual-frequency chip, the BCM47755, in September of 2017. Broadcom said that its BCM47755 would be featured in 2018 smartphones, but never elaborated on which ones exactly. Xiaomi finally made good on Broadcom’s promise with the Xiaomi Mi 8, revealed in late 2018. Other vendors have been slow to jump on the wagon, however. The Galaxy S10 series, Samsung’s most recent offering, does not feature dual-frequency GNSS—at least the Exynos version doesn’t. At the moment, Huawei and Xiaomi are the only two vendors of note whose smartphones officially claim to support dual-frequency. But, Xiaomi is the only vendor where the use of dual-frequency GNSS has been observed in third-party apps. So why is dual-frequency GNSS such a niche feature? The most likely answer is cost. Dual-frequency chips are not exactly commonplace at the moment, so it may be hard for manufacturers to get their hands on them. Another possible explanation is that vendors simply don’t view it as an important feature. By and large, accuracy to within 5m is enough for day-to-day usage. That being said, there are still numerous groups of people who would benefit from increased accuracy. The first groups that jump to mind, for example, are joggers and hikers. 5-meter inaccuracies can build up to form significant distance discrepancies over a period of time, which may lead a jogger to believe they’ve run further than they actually have. Does my phone support dual-frequency GNSS? Very few phones at the moment support dual frequency, so the most likely answer is no. There are a multitude of apps out there that can help you determine if your device supports dual-frequency GNSS. The one we recommend is GPSTest by barbeauDev, which is available on GitHub, as well as Google Play. All you have to do is load up the app (preferably while outside), let it lock your location, and then check the CF column to see if there are any L5 or E5a readings. Sean Barbeau, the developer of the GPSTest app, maintains an updated list of supported devices over at Medium. There are detailed analyses of many devices available there. What phones currently support dual-frequency GNSS? Currently, the Xiaomi Mi 8 and the Xiaomi Mi 9 are the only devices that both officially claim to support dual-frequency. The use of dual-frequency has been confirmed using 3rd party apps. For the Huawei Mate 20 X, Huawei Mate 20 RS, Huawei Mate 20 Pro, and Huawei Mate 20, the devices are listed as supporting dual-frequency GNSS but, due to lack of support for some of the GNSS Android APIs used by 3rd party apps, the use of dual-frequency GNSS cannot be confirmed using 3rd party apps. The Hong Kong Snapdragon 855 variant of the Samsung Galaxy S10 also appears to support it, based on 3rd party apps, but this is as yet unofficial as Samsung does not list support in the official specifications for the device. We reached out to Samsung for clarification but did not receive a response by publication time. Below is a table of popular phones detailing whether or not they support dual-frequency GNSS, and what global systems they support too. Google maintains a list of devices that support raw GNSS measurements, which is the basis of the following table. Xiaomi certainly seems to view dual-frequency GNSS as a valuable investment, however. After its initial inclusion in the Mi 8, Xiaomi also brought it over to the Mi 9, so it seems like it’s not going anywhere for now. Dual-frequency GNSS is readily available for every vendor, but they are being very slow to adopt it. While the reasons why are unclear, it’s likely that we can point to cost as a contributing factor. Xiaomi is leading the charge at the moment, but it remains to be seen if other major vendors are going to jump on the bandwagon. Dual-frequency GNSS can prove to be absolutely vital in big cities where multipath errors are a common issue. With the Galileo satellite constellation in Europe nearing completion, now is a better time than ever for companies to start looking at dual-frequency GNSS in earnest. 19-year-old computer science student finding his feet in the world of journalism.